Guest post by Laura Briere, president of Vision Advertising. A good relationship with your loyal customers is worth a fortune. Hence, relationship marketing should be at the heart of your business. Why is relationship marketing priceless? When everything you do revolves around your community – customers, fans, followers, employees, etc. – the answer is clear. You will have the reputation, loyalty and love that keeps your business alive and thriving. You will have a connection with your audience, and that’s the key to success for your company. Take the focus away from the dollar signs attached to your products and services, and focus on what’s really going to affect your sales: relationships. Relationship marketing online is a fine balance of technology and personality. Something that has remained constant throughout the years is the power of relationships in business. Relationship marketing these days is just presented in a different arena – online. There are people who may insist that there were no problems or disconnect until the Internet came along. This simply isn’t the case. Technology is not the cause of this disconnect; the cause is the people behind the computers. If your online presence is genuine and your brand is “real,” relationships will blossom. And since nearly 90% of consumers use search engines to make purchasing decision (Digital Influence Index), you better believe that a strong community presence will feed your bottom line. To create a healthy community online, set up a steady foundation for your relationship marketing. Understand your audience. Identify your niche market and how you plan to solve their problems. Have a clear vision for who your products and services are going to help so you can target them more directly with a message that resonates more powerfully. Engage with your audience. Write with your audience’s wants and needs in mind. Listen to their feedback – good or bad – and give them a say in the conversation. Conversation is a two-way street, and there’s a difference between talking to people versus talking with them. Be a part of your community. Be present in conversations about your own brand and your industry. A good relationship marketing strategy covers all aspects of a community – from customers to competitors. Find ways to join in on relevant conversations, offering your own opinion, experience, expertise and input. Just be sure you have something worth saying. Demonstrate your expertise. One component of your relationship marketing strategy must address the fact that there is competition for what you’re offering. People will respect and listen to you more intently if your language is confident, clear and beneficial. If you’re not the expert in a certain area, that’s okay. Seek the advice or help of a non-competitor who knows the subject through and through, and give them credit for their knowledge. Answer questions. Create free downloads, pay close attention to what people are asking on social media sites, and set up a blog dedicated to helping visitors find the answers to their most common questions. Your customers want to be acknowledged and appreciated. Provide excellent service. Don’t just stop online with your relationship marketing. Continue the process offline and really show your customers that you appreciate them. Treat them with respect before, during and after a sale. The purpose of relationship marketing is to put the “people” back in business and ignite that “warm and fuzzy” feeling. It’s about having actual human beings dedicated to nurturing your online presence and every person that is a part of it. Take the focus away from profits, put it back on relationships, and trust that the profits will come as a result. That’s relationship marketing in a nutshell. 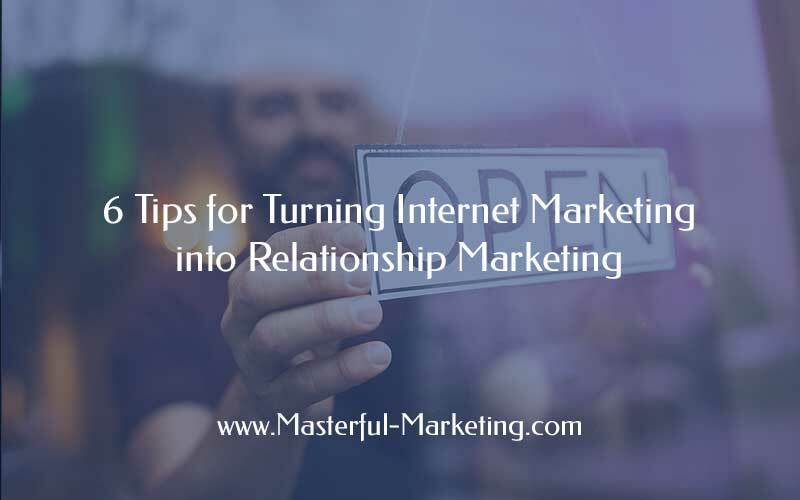 Are you building relationships with your internet marketing? This is a guest post by Laura Briere, a marketing expert, colleague and friend. Laura is the President of Vision Advertising, an internet marketing company focused on search, social, email, reputation and public relations marketing. Yesterday I have join this masterful marketing and try to understand the strategies i.e Internet Marketing into Relationship Marketing . I appreciate this which is being shown in your brief description on the above topic. I will try to continue to read and understand better strategies ether in internet marketing or others..
Great strategy of marketing. These will help us to achieve our target. Thanks for sharing this beautiful tips.